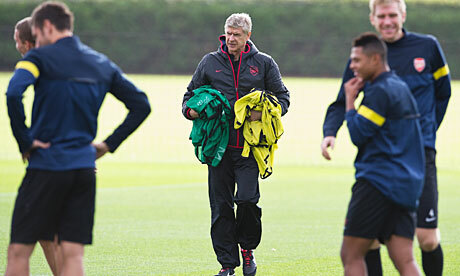 Arsene Wenger steals everyone's training kits. I don't want to dwell on what happened at the weekend. I hate writing about frustrating losses; it's why I would be a horrible recap writer. And you, Average Internet Gooner, have probably already read more than you would have really wanted to about that match anyway. I won't dwell on this. It's time for Arsenal to get up, dust themselves off and all that, and get back on the right track in these two matches before the Interlull. A Champions League match at home is a good way to get back into the groove, especially since a poor result here would put a tremendous amount of pressure on the side going into one last match before a two week break. That last match is a London derby, away from home, against a side managed by a walrus that always manages to frustrate. It's paramount to go into that situation feeling good about yourself. forgotten how to wear a shirt. Photo: The Tuesday Club. Good news! Jack Wilshere completed 63 minutes of reserves action on Monday. Good news! Emmanuel Frimpong played about 70. Bad news! Arsenal lost anyway. Bad news! Abou Diaby has returned to what we're used to, in that he is out three weeks with a thigh strain. Wojciech Szczesny remains "two to three weeks away" with his ankle injury. Bad news! 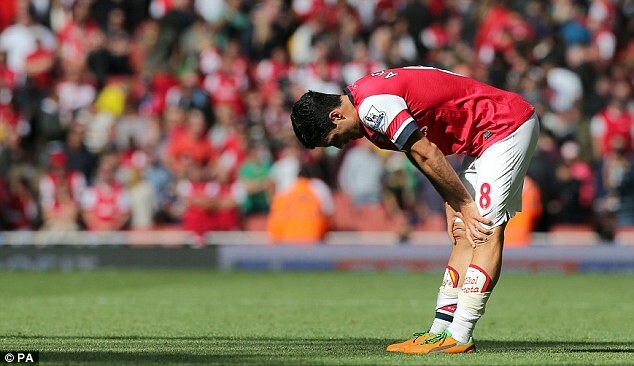 Mikel Arteta faces a late fitness test over an ankle injury. Arsenal struggle mightily when Arteta is not firing on all cylinders in the midfield. He was hounded all game by Chelsea's attacking midfield trio and that really hindered Arsenal's transition game from defense to offense. There's a built-in rest period coming up in the form of the international break, but if he isn't fit, he should rest. This can't be allowed to turn into a three week injury. Predicted XI: Mannone, Jenkinson, Vermaelen, Mertesacker, Gibbs, Coquelin, Oxlade-Chamberlain, Cazorla, Podolski, Gervinho, Giroud. indicates. Photo: The Offside - Ukraine. First things first, let's talk about spelling. Is it Olympiacos with a C or Olympiakos with a K? You can tell based upon the way I spell it throughout here, I use the C, even though fans of the club prefer it spelled with a K. The reason? The club's official Web site uses C. That seems official enough. Now that that's taken care of, let's talk about the state of the team. Basically, they are weaker than they were at this point last year. Captain and center back Olof Mellberg departed for Villarreal. Forward Kevin Mirallas left for Everton. Olympiacos will be without Algerian international forward Rafik Djebbour with a thigh injury. Defender Avraam Papadopoulos is a long term injury, having suffered a knee injury during the Euros. Fellow defender Tasos Papazoglou picked up an injury at the weekend. Ljubomir Fejsa and Vasilis Torosidis are also expected to miss through injury. Finding reliable information about the opponents in the Champions League is difficult; I can't even tell what injuries most of these players even have. in the future, please. Photo: Daily Mail. Arsenal suffered their first competitive loss since April 16 on Saturday, having gone seven matches in all competitions without losing to start the season and 11 matches unbeaten in total dating back to the end of last year. But, as for the matter at hand, let's talk about their home form in the Champions League. Last year, Arsenal beat Udinese, Olympiacos, Dortmund, and Milan at home, with a draw against Marseille thrown in as well. The year before that, they won all four European games at home: against Braga, Shakhtar Donetsk, Partizan Belgrade, and Barcelona. In 2009/10, they beat Celtic, Olympiacos, Standard Liege, AZ Alkmaar, and Porto at the Emirates, while also coming from behind to draw Barcelona in the quarter-final, 2-2 before going on to get annihilated at Camp Nou. So, in total, including qualifiers, that's 15 unbeaten matches at home, with 13 wins. The streak ends there, though, unless you decide not to count English competition, in which case, the streak goes back to 2003. Inter Milan were the last non-English team to win at the Emirates in the Champions League, and Arsenal beat them pretty handily and famously later on in the group at the San Siro. As for Olympiacos, let's talk about their form to start this season. They have five wins from five in Greek Super League play and have opened up a three point lead on PAOK at the top of the table. They are in some trouble in Europe though, having already lost a home match, 2-1, to Schalke. Vito Mannone in "The Karate Kid IV"
Arsenal and Olympiacos have been paired in the same Champions League group in three of the past four seasons. Arsenal have won both prior meetings in London; Olympiacos have won both prior meetings in Greece, though both of those came after Arsenal had already clinched winning the group. Oddly enough, in those prior meetings, the matches in London have fallen on Matchday 2 and the matches in Greece have fallen on Matchday 6. It's the same this year, too. Last year, in late September at the Emirates (apparently Matchday 2 was slightly earlier last year,) Alex Oxlade-Chamberlain became the youngest Englishman to score in the competition for the club, with his 8th minute goal to put Arsenal ahead. Andre Santos made it 2-0 on 20 minutes, but Olympiacos scored from a set piece in the 27th to make it 2-1. The score held that way, though the final 63 minutes were more tense than a Gooner would have liked, with Olympiacos hitting the woodwork in the second half with a near equalizer. Last year's result in Greece on Matchday 6 was terrible. Lukasz Fabianski started, conceded a goal (it was Squillaci's fault,) then left with a gash caused by a collision with Thomas Vermaelen. Vito Mannone came in and did much, much worse. Arsenal lost 3-1, and also lost Andre Santos to injury for a few months. Photo: A Polish Real Madrid blog. The referee is Norwegian Svein Oddvar Moen. This is Moen's third season working Champions League matches and this is his second Arsenal game. He previously took charge of Arsenal's 2010 Matchday 3 win over Shakhtar Donetsk, which ended 5-1 in London. In terms of other sides from England, Moen has taken charge of two Chelsea matches in Europe, both draws against the likes of Copenhagen and Genk. This is his first Olympiacos match and his first involving a Greek side. In September, Moen was in charge of the World Cup qualifier between Spain and Georgia, which the reigning champions left late to win 1-0. The deepest match he worked in the Champions League last season was the quarterfinal between Bayern Munich and Marseille in Germany; Bayern won 2-0. It was a famous Tuesday night for BATE Borisov, as the Belarusian side defeated last year's finalist Bayern Munich 3-1. BATE have two wins and six points and sit at the top of Group F. Also, did you know Alex Hleb plays for them again? Elsewhere in Group F, Valencia beat Lille 2-0. As for other surprising victories, Celtic won a Champions League away match for the first time since the Celts invaded the Balkans in the fourth century BC 1986, as they beat Spartak Moscow 3-2 in Russia. Barcelona beat Benfica to stay top of the table, but lost Carles Puyol to a nasty arm dislocation. To the groups with English sides in them, one-man team Manchester United came from behind to beat Cluj 2-1, Chelsea struggled for a little while with debutants Nordsjaelland but eventually pulled away to win 4-0. Elsewhere in United's group, Braga beat Galatasaray 2-0 in Turkey, and in Chelsea's group, Juventus and Shakhtar Donetsk drew 1-1 in Italy.